Going to the bank, setting up an account, ATMs, it all seems so simple. We can get paid and hardly think twice about it with direct deposit, we can transfer money from accounts practically seamlessly, it’s 2017 and the banking system as we know it is about as easy as can be. Many of these factors can be accounted for the FDIC, otherwise known as the Federal Deposit Insurance Corporation. But where did this come from, and why? First Western Federal Savings Bank is an FDIC-insured bank that can provide the best in non-recourse loans, helping cash out CRP payments, and so much more. We provide banking in a way that brings the comfort of a small-town feel to a nationwide level. Learn how the FDIC came to be, and start getting making your real estate dreams become a reality with First Western Federal Savings Bank. Contact us today! The Federal Deposit Insurance Corporation is an agency that was created with two missions in mind. Firstly, those depositing in a bank were largely unprotected until the FDIC was created in 1933, so one of the goals was making sure they would be covered. The second goal of the FDIC is to not only protect the bank depositors, but to create trust and safety in the banking system as a whole. 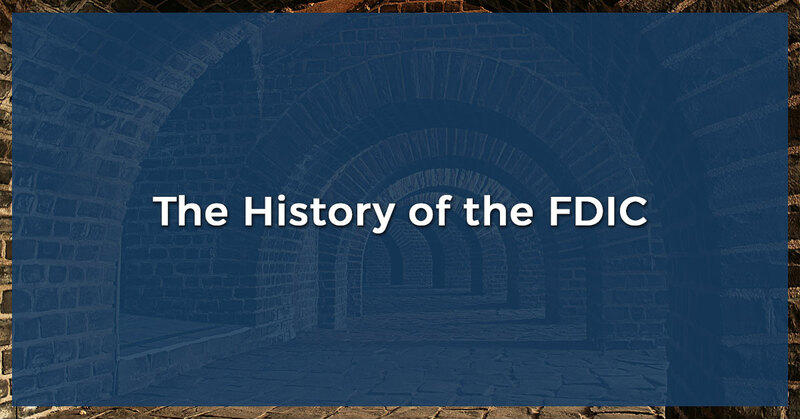 We will start to dive into what happened with the creation of the FDIC, and much of this was build up that happened in the precursory years to its origin. Covering the intricacies of World War I is practically akin to trying to explain the first 20 years of your life—tons of details, lots of people involved, and likely very messy. Ultimately, neither can be summarized accurately. But for the sake of how it’s related to the FDIC, there are some key points that can lay out the direction that led to the induction of this federal agency. As History reports, “In February 1917, Congress passed a $250 million arms appropriations bill intended to make the United States ready for war.” Considering that $10 million in 1917 was equivalent to over $200 million in 2017, this can put it into perspective how much money was set to start going towards war. War is undoubtedly expensive, and World War I was when the world became familiar with the horrors of trench warfare. War technology reached new highs (and simultaneously, new lows) with introductions to chemical warfare, submarines, and planes, to name a few. These were technologies unlike anything the world had ever seen, and the damage they incurred was astronomical. Over 9 million soldiers were killed, and civilian casualties were even higher—estimated around 10 million. Countries collapsed, and the war contributed to the spread of the infamous flu epidemic of 1918, which killed between 20 and 50 million people. All of these things had massive repercussions for all corners of the world, even if not noticeable right away. Post-World War I, the United States was seen as this beacon for prosperity, culture, and wealth in general. Called “The Roaring Twenties,” this was a time when production was at a high, and the influx of excess was common. And yet, this was not actually an accurate representation for the times themselves. Mexican Americans faced enormous racism and discrimination in the west, forced to work in jobs and in conditions that would be considered highly illegal by today’s standards. African Americans, particularly those living in the south, lived in the crushing oppressive forces brought forth by the Jim Crow era. Many were sharecroppers, and were paid egregiously low wages that were representative of the racist systems as a whole. Even for white people, the disparities between wealthy and impoverished were starking. Reports showed that more than 60 percent of the population were living below the poverty line, and a third of the income being produced in the United States was from only five percent of the population. This started showing signs of economic disparity, and some foreshadowed the eventual crashes that would happen. Back to the recovery of World War I, so many countries were completely crushed by this horrific period that the United States became a lender and world banker. Europe, unable to pay a country that was by and large unblemished from the war (purely due to the war happening overseas, not at home), started to buy less from the U.S. as well. This led to a global crisis, the stock market began to plummet, and in October of 1929, the stock market completely crashed. When the market started to crash, the people started to panic. Those with money in the stocks began to pull their investments at the speed of lightning, leading to an even more insecure market. Even outside of the stock market, people began to withdraw money from their banks, fearing they would lose it. And their suspicions were highly warranted—at this point in time, there was not a protective force in place, and the banks simply did not have the money. All of it was based on this fine balance of trust, and when people couldn’t get the money from their funds, everything began to crash. President Franklin Delano Roosevelt was inaugurated in 1933, and within a few days time, he started passing emergency legislation that would work to build back the banking system (as well as the trust needed for it to be successful). The day after his inauguration, he closed all the banks in the country, declaring a national bank holiday. He did this to try to prevent further panic from ensuing, and we still have national bank holidays today. FDR did a lot to try to aid job creation, as unemployment rates had skyrocketed across the nation (some cities or towns had almost 100 percent unemployment). Some measures taken were the Civilian Conservation Corps, which offered conservation jobs to over 200,000 men that would help their families in return. Working with an FDIC bank such as First Western Federal Savings Bank means you are backed, and your money is safe. The banking systems we have today are often something we take for granted, but it took some significant ruin to build up to the more secure systems we have today. Invest with an FDIC bank that has expert non-recourse lenders who are trusted across the nation—contact First Western Federal today.